Practicing in Bend on and off since 1994, Dr. Ward is back in Bend and ready to help the community find the relief and health he thinks everyone deserves. Just as he stays active so he can enjoy the outdoors, he’s here to help you feel and perform your best, too. 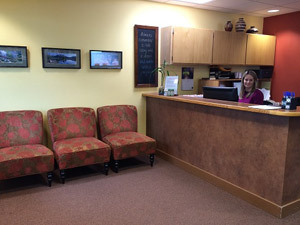 You will always be greeted with a smile at our office! Dr. Ward wants to help everyone feel better about their life. He’s here to help you find relief from your aches and pains so you can get back to doing the things you love. He welcomes infants to the elderly, athletes and families. His goal is to help each person in his or her own unique way. Dr. Ward will work to help you in the following ways to allow you to live a great life and reach your full potential. The one thing Dr. Ward’s patients all say is that they love the way he adjusts them. With years of experience and a gentle approach to care, his patients love his cervical and extremity adjustments and impulse instrument adjusting. Are you ready to get started? Give (541) 610-9662 a call and get started today!